Introduction: Laparoscopic colon resection offers the possibility of decreased length of stay, less pain and faster recovery when compared to open surgery. These benefits may be particularly beneficial in at-risk patient populations such as the elderly. Methods: At a single institution, 103 consecutive laparoscopic colectomies for both benign and malignant disease were examined. All surgeries were performed by the same three surgeons throughout the study period, and hand assisted techniques were not used. Patients were stratified by age (<70 and >70 years). Multiple clinicopathologic variables as well as length of stay, and discharge to home or nursing homes were compared between the groups using non-parametric tests. General fast-track colorectal surgery principles were applied equally to both groups, including early enteral feeding, epidural anesthesia, early catheter removal, but not almivopan. Results: Of 103 patients, 41 (40%) were >70 years old. There were no significant differences between the two groups with regards to gender, types of operations performed, lymph node yield, mortality, or major complications including anastomotic leak, pulmonary embolism, major bleeding, enterocutaneous fistula, and post operative bowel obstruction. There were more patients with a diagnosis of cancer in the >70 year old group (75.6% vs 58.1%, p = 0.062). Post-operative ileus rates were 5% in both groups. The wound infection rate was 13.6%, with no difference between groups; however there was a higher rate of post-operative urinary tract infection (UTI) in the >70 year old group (7.3% vs 1.6%, p = 0.049). Average length of stay (6.1 days), operative time, blood loss and time to return of bowel function (4.2 days) were similar. A higher percentage of patients in the >70 year old group required a discharge to skilled nursing (27.5% vs 8.3%, p = 0.011, Mann-Whitney). 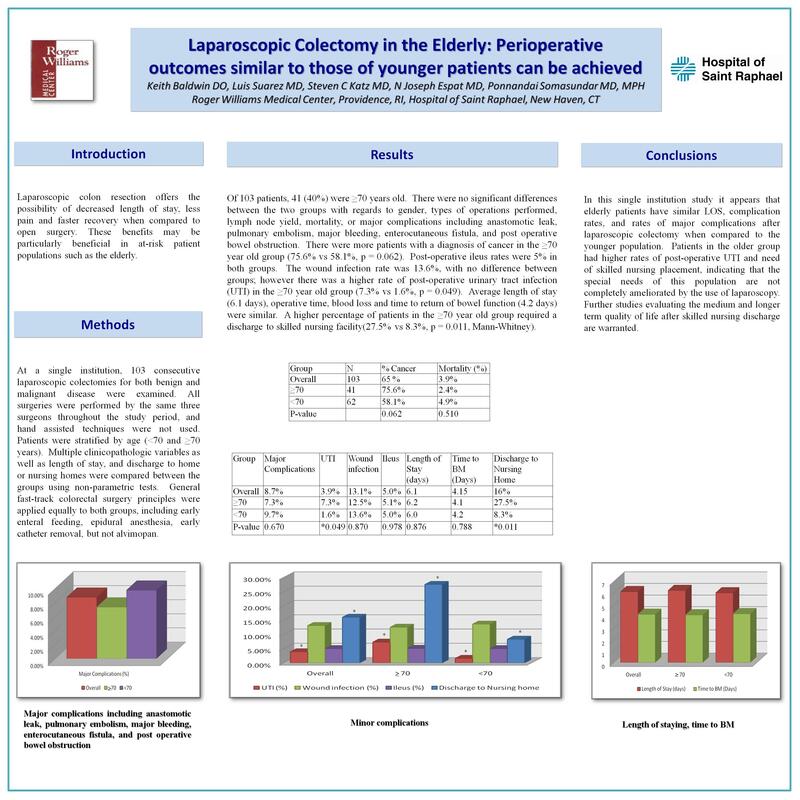 Conclusions: In this single institution study eliminating surgeon bias, it appears that elderly patients have similar LOS, complication rates, and rates of major complications after laparoscopic colectomy when compared to the younger population. They still have higher rates of post-operative UTI and need of skilled nursing placement, indicating that the special needs of this population are not completely ameliorated by the use of laparoscopy. Further studies evaluating the medium and longer term quality of life after skilled nursing discharge are warranted.